That’s very creative and nicely executed. Out of africa under a shower. This is what i thought looking at this picture. I like the harmony of colors. Nice image. Wow. I just love how the water makes this photo look like a painting. A slightly wet painting, ha. Lovely shot! I’ve been trying to find a similar concept, but I can’t seem to find it. Don’t wanna buy a window frame and spray water on it. Great shot! Many of us make an attempt like this, but what you have here is beautiful. Love the colors. Great execution. Ok, I am going to be a little less poignant than everybody else, but on a technical note I feel like it makes a HUGE difference that the window you shot through was clean. Well done! So beautiful. It is cool yet it is based on a very hot environment. Nice shot! 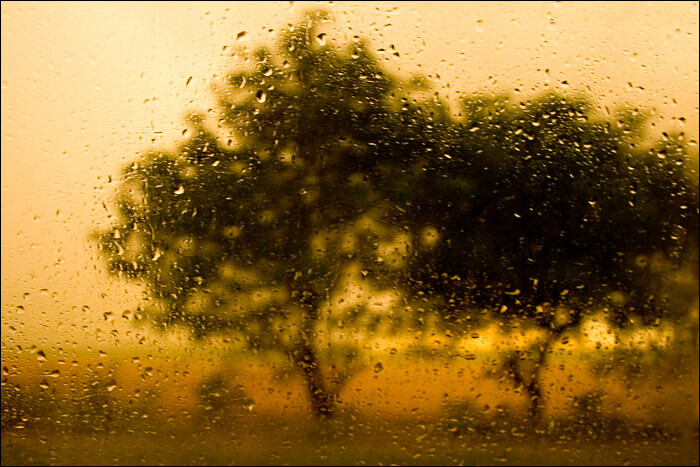 Cool effect, it looks like a mix between a rainy day and a hot summer day since it is so yellow out. I WISHED BEING WITH YOU BEHIND THAT GLAS WHEN YOU TOOK THIS SNAP!